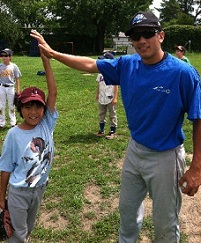 In 2012, Coach John Valente began coaching on the Single A Field at Rising Star Baseball Camp. After graduating New Rochelle HS as a standout baseball player, he was recruited to play infield and be used as a relief pitcher at nationally ranked St. John's University. Coach Valente began his playing career at St. John's University in the spring of 2015. Valente also attended the Rising Star Baseball Camp during summers 2008-2010 where he impressed the coaching staff with his "five tools", hustle, and fiery approach to playing the game.